Students working on a project in the Dominican Republic. To dig deeper? To learn about yourself and the world? To create community? 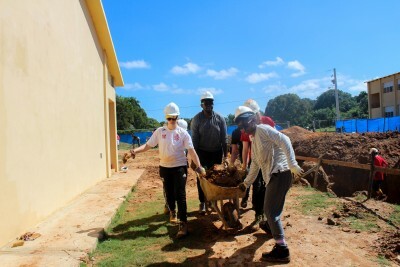 Alternative Spring Break (ASB) is an immersive experience that connects students to domestic and international partners committed to positive social change. Students learn about social, environmental, and cultural issues impacting their host community, while supporting meaningful, community-identified projects. What is Alternative Spring Break? ASB is a year-long program that culminates with a week of action, reflection, and social engagement with a partner organization during reading week in February. In 2018/2019, six different experiences will be offered. Each will be focused on specific themes, including access to education, environmental sustainability, and access to clean water. The reading week experience is preceded by months of active preparation, which includes participation in guest speaker seminars, local community service, fundraising efforts, and team-building exercises. Students are also encouraged to engage in personal reflection and make connections to their academic studies throughout the program. These activities enrich students’ learning experience, strengthen community, and help them understand their role as catalysts for change. Read stories from students who have previously taken part in the ASB program. Visit our FAQ for more information on the program.